Ensure a memorable evening out in Shanghai on this 4-hour tour, including dinner at one of the city’s Michelin-starred restaurants. 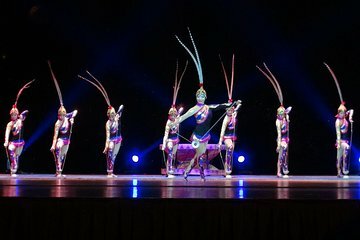 Tuck into delicious soup dumplings, wontons, and other Chinese specialties at Din Tai Fung restaurant, then enjoy a spectacular 75-minute performance by the Shanghai Acrobatics Troupe, including martial arts, circus tricks, acrobatics and magic acts. Hotel pickup and drop-off is included. Our guide Pamela was wonderful, we enjoyed so much the dinner, great restaurant and great conversation. The acrobatics show was amazing! Outstanding evening starting with the food at Ding Tai Fung. Our guide Charlie helped us navigate the large menu and the hairy crab as well as stick rice pork dumplings well worth a try. Charlie pointed out many sites as we took the 20 min drive to the show, giving many interesting facts about Shanghai. The show was jaw dropping really well out together and the best act is the last one with the motorbikes.... leaves you with a WOW. Great night for a couple or even a young family. The acrobatic show was great & kept us on our seat as it was amazing. We headed towards the restaurant Xin wanted to share with us but was closed but with not any problems she had it sorted & we headed off to another one. Again she ordered great choices and everything again was really nice. We all enjoyed the day and glad we got to do both tours with this company. Cheers! Vicky our guide was lovely and managed to get us good VIP seats. The only thing is that this place is a little shabby and the performers were a bit shabby, unlike the Kung Fu Show in Beijing which is a must see. For the dinner at the Ding Tai Fung - nothing fancy. It seemed like any other restaurant in Shanghai. There should be better options to the restaurant. The tour guide Vicky was very friendly and accommodating. A very nice person. She ensured we sat in the VIP seat and right in the middle - in front for the acrobatic show. The show was an okay one, but couldn't have been better. It was a shabby venue with shabby costumes, unlike the Kung Fu shows in Beijing. For the Ding Tai Fung restaurant, I would personally say, it felt like just another Shanghai restaurant. Good tour guide and tour company - very accommodating, but show and food options should be better and worth the money and time spent. Thank you for making this a beautiful last night for us in Shanghai - from start to finish, Viki. We had a fantastic time. Viki arrived 30min before the agreed time at our hotel. The car was clean and comfy. On the ride Viki explained us about Chinese and Shanghai history, what was very informative. In the restaurant, Viki ordered a wide range of Chinese specialties. The food in the restaurant was delicious. The absolute highlights were the Chinese artists. We saw very talented acrobates, magicians and clowns - all illustrated with beautiful costumes and music. As it was our last night in Shanghai, Viki organised a lift directly to the airport for us for a small extra payment. We had a memorable night. Thank you Viki and the entire team. Alana is a gracious, polite and knowledgeable guide. The restaurant she chose was excellent. Very, very good food and comfortable atmosphere. it was nice to have a short car tour around that upscale part of town before returning to the hotel for the acrobatics show. Good show - amazing talent. A very enjoyable evening and good way to learn more about Shanghai. While in Shanghai we were keen to see an acrobatics show – something Shanghai is renowned for. We’d been on a previous tour with Alana and she suggested combining the acrobatics show with a trip to Din Tai Fung, a well-known dumpling restaurant. We were not disappointed – great seats at the show which included a wide variety of skills and amazing acts. Din Tai Fung gave us the opportunity to try out Shanghai’s delicious xiao long bao (soup dumplings and pork buns). Another great night out with both destinations worthwhile. Beautiful show and good dinner. Thats It.